At first glance, making a B-movie can seem like cheating. Let’s face it, they’re not exactly known for high quality filmmaking in the traditional sense. However, in some ways, making a B-movie at a mainstream movie level is a very tricky balancing act. A certain level of absurdity is required when dealing with a giant spider plot, but you need to keep at least some semblance of logic. The special effects should be slightly cheesy, but good enough to look basically realistic. The acting should be a bit uneven, but not painfully bad. Etc., etc., etc. What is absolutely essential, however, is a healthy dose of that intangible energy and fun-loving spirit, and in that respect Eight Legged Freaks puts the other so-called summer blockbusters to shame as it is the most entertaining and exhilarating thrill ride of the summer. It sticks very close to the standard creature feature formula with no surprises. Toxic waste falls into a pond near the ironically named and conveniently isolated town of Prosperity, Arizona. Naturally, the pond just happens to be near an exotic spider farm. 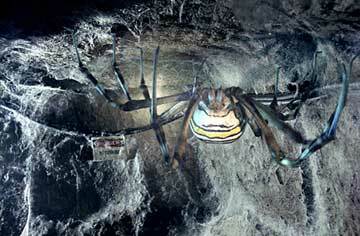 The toxic waste causes the spiders to grow to enormous size and run amok. Trying to avoid becoming dinner is a cast of various flavors of stock characters including the brooding hero, the plucky sheriff, the rebellious teenage daughter, the greedy mayor, the dopey deputy, the conspiracy theorist, and the kid whom everyone ignores even though he is the only one who knows what’s going on. The real stars of the movie though are the spiders, of course. We get a crash course on the various spiders, from the old standby tarantula to the jumping spiders and orb weavers, when they are a more manageable size. As for the giant spiders, the CGI technology used to bring them to life is pretty standard, if not pedestrian, these days. The amazing thing about the giant spiders is the personality that they are endowed with, particularly through the sound effects. I’m certain that these spider sounds are far removed from any sounds spiders make in nature, but they transform the spiders into characters. Eight Legged Freaks hits the perfect action-comedy tone. It provides a bit of squirming, maybe a jump or two, but mostly laughs because as everyone knows, watching people get eaten by giant spiders is just plain funny. As the movie builds toward a raucous finale, it harkens back to classic creature features, but is more reminiscent of somewhat more recent comic entries like Tremors or even more particularly Gremlins. The producing team behind Eight Legged Freaks, Dean Devlin and Roland Emmerich make B-movies. However, with growing box office, budget, and hype, they seemed to want to take their films in a more “serious” direction and lost the B-movie essence, ultimately resulting in Godzilla. With the help of Kiwi director Ellory Elkayem, they have recaptured that spirit, and it’s nice to see the obvious joy of the genre in the film.